George R.R. Martin and actress Maisie Williams attend a party to celebrate season five of HBO’s “Game of Thrones” in San Francisco. 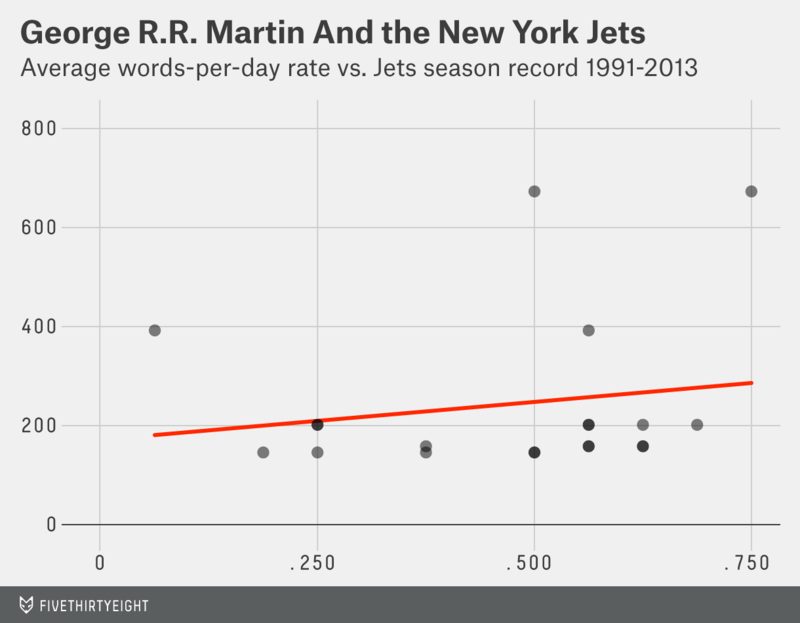 There’s a cool new statty analysis of when “The Winds of Winter” — the next book in George R.R. Martin’s “A Song of Ice and Fire” series, which inspired HBO’s “Game of Thrones” — will be published, and there are a couple of reasons to take this one seriously. The best guesstimate: late 2016, early 2017. First, a brief overview of why this is a thing. Martin, who writes the books, writes the books slowly. It’s already very likely that the show will conclude before the books do. It’s been confirmed that details from unwritten books will be on screen this season, which makes sense because they’re running out of source material. When will George R.R. Martin come out with the next book? I have no idea. The stats tell us essentially nothing. The good news for fans is that he’s in Santa Fe with a pretty clear schedule. The worst news is that my most promising finding is that he’s excited. As always, when will George R.R. Martin release “The Winds of Winter”? Whenever he damn well pleases. An individual who is well-respected in the fan community has published a huge analysis of Martin’s writing habits. The writer — real name Jeff, well-known online as “BryndenBFish” for his sophisticated analyses of military strategy in the book series — is one of probably like five people (two of the others are profiled here) whose opinions and predictions about “A Song of Ice and Fire” I take really seriously. Jeff told me that he’s written 159,483 words about the series on his blog alone. What I’m trying to say here is the guy gets Martin. And he took the idea of writing pace estimation past the back-of-the-napkin level, to a deeper level of analysis that hadn’t really been done before. If you cornered me, put a gun to my head and told me to tell you how many completed manuscript pages are done for The Winds of Winter, I’d probably say that George is just north of 1,000 manuscript pages with an expected completion date of late 2016 to early 2017. I think the average pace of 287 manuscript pages/year that George wrote between 2008 and 2010 is probably a good data point. If George had 1,350 pages to write from the end of A Dance with Dragons, 287 average manuscript pages per year would have George finishing The Winds of Winter in early 2017. That’s a long wait. My recommendation in the meantime remains simple: Root for the New York Jets.